Receiving the Rwandan Minister of Foreign Affairs, Louise Mushikiwabo, who visited as Special Envoy of President Paul Kagame at the State House, Abuja yesterday, President Buhari said Nigeria would strive to bring back its citizens who were stranded in Libya. He said: "Illegal migration is now a major issue in Africa. Many dare the Sahara Desert and the Mediterranean Sea to get to Europe and many die in the process. Or they get into trouble, as we now see in Libya. I don't envy our position, as many blacks claim to be Nigerians, even when they are not." The President said Kagame, as the incoming Chairman of the African Union (AU), had the issues of South Sudan, separatist agitation in southern Cameroon, unrest in Togo, and many others on the continent to contend with. He pointed out that former President Muammar Gaddafi's long rule produced many people, whose only skill is how to shoot guns. "Now, they are scattered around the continent still with their weapons and fomenting trouble," President Buhari said, adding that Nigeria was taking steps to curtail the development. A statement by Special Adviser on Media and Publicity, Femi Adesina yesterday quoted Mushikiwabo as saying that President Kagame looked forward to Nigeria's counsel and support, as he assumes the AU chair from this month. 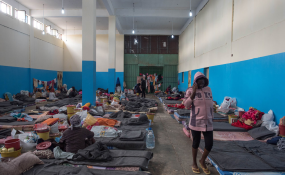 Meanwhile, the Delta State Government yesterday ordered the screening of 80 Libya returnees who are from the state among the 5, 500 returnees received by the Federal Government recently for various diseases. Commissioner, Bureau for Special Duties, Ernest Ogwezzi, who represented Governor Ifeanyi Okowa, thanked God for the lives of the retirees and their successful homecoming. He urged them to put behind the experiences that may have given them nightmares and choose a new path for their lives. He, however, stated that the state government would not be able to give them automatic jobs but would engage them in its Skill and Entrepreneurial Programme (STOP).